When exposed to a high-voltage electric field, water in two beakers climbs out of the beakers and crosses empty space to meet, forming the water bridge. 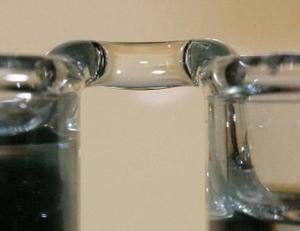 The liquid bridge, hovering in space, appears to the human eye to defy gravity. Upon investigating the phenomenon, the scientists found that water was being transported from one beaker to another, usually from the anode beaker to the cathode beaker. The cylindrical water bridge, with a diameter of 1-3 mm, could remain intact when the beakers were pulled apart at a distance of up to 25 mm. Can you think of a practical use? If so, please let us know! These excerpts are from an article at http://www.physorg.com/news110191847.html which contains additional details on this phenomenon.